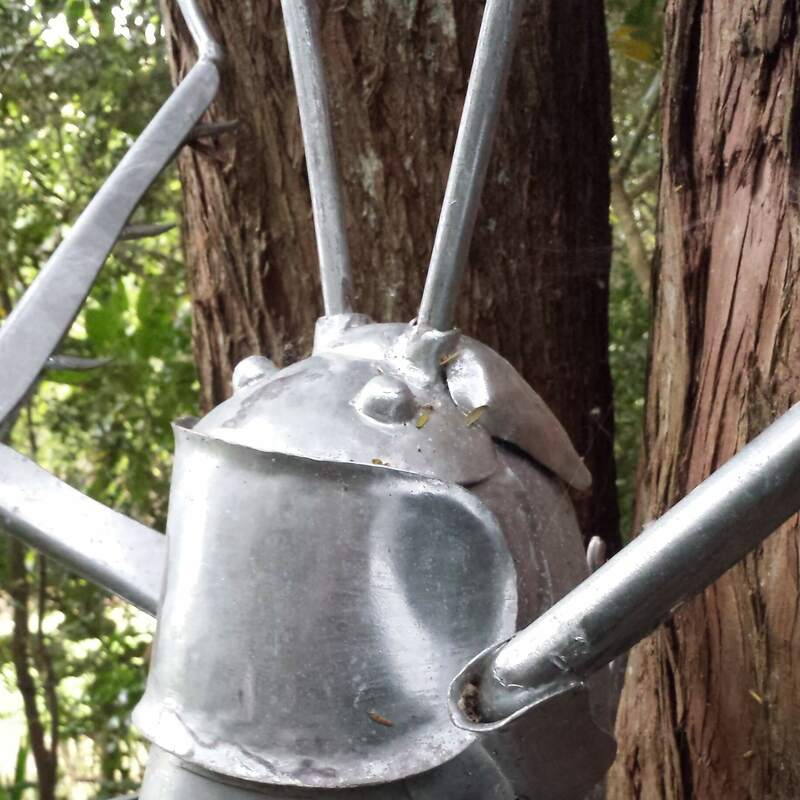 A Giant Poor Knights Weta. Artist: Bruce Young. 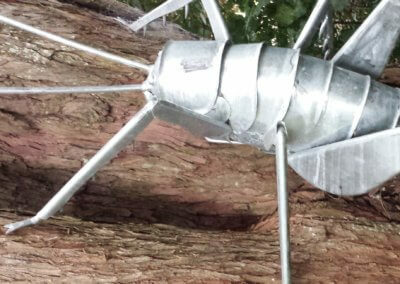 The area is the home of families of Tree Weta, accommodated in Weta Houses. Open the door to see the family inside. How many wetas can you count? 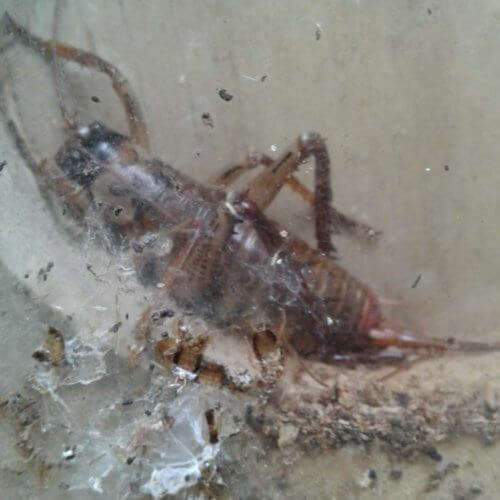 Tree weta (Hemideina) most commonly live in holes in trees formed by beetle and moth larvae or where rot has set in. Their home is called a gallery. There are seven species of tree weta but the ones at Rocky Bay Cove are called Hemideina thoracica, which are found over most of the North Island except for Wellington (they must not like politicians!) and areas 900 metres above sea level. 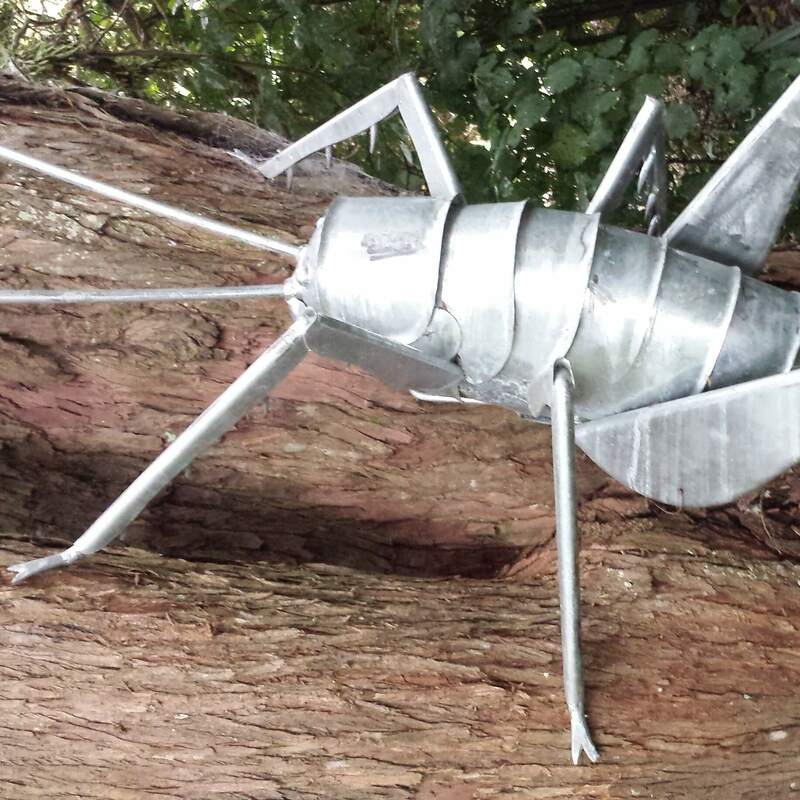 A fully grown tree weta has a body between 4 and 6 centimetres long. 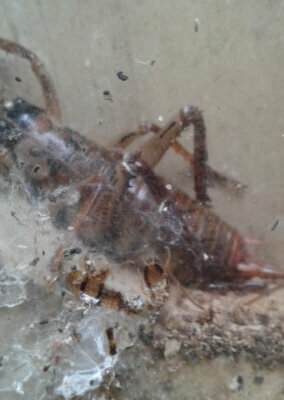 They are nocturnal so be careful when opening the weta houses as they will be sleeping! 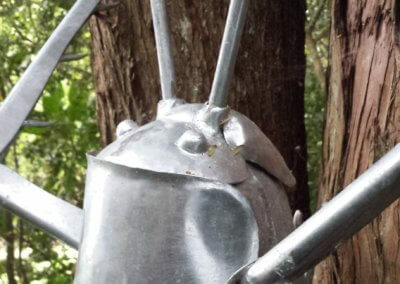 If you want to see them at work, take a torch and visit the weta area at night. The Tree Weta is mostly herbivorous – they munch away on leaves, seed heads, fruit, and flowers. Females have a long ovipositor (egg laying tube) that looks like a stinger at the rear of her body. The ovipositor is used to push deep into hard to get places, like into rotten wood, where the eggs will be safe until they hatch. They lay their eggs in autumn, 6 to 10 at a time. In her lifetime a female will lay up to 300 eggs. It is believed that weta only lives for about two years. The male has two small pinchers at the rear of their body. Their natural predators are tuatara, kiwi and the morepork. However, introduced animals like rats, mice, and cats are a greater threat. Did you know weta have their eras on their front legs? Have a look at the knee and you may see them. The Giant Weta is the largest insect in the world. They are found primarily on New Zealand offshore islands including the Poor Knights Islands, having been almost exterminated on the mainland islands by introduced pests.